Russian economic heft was one of the decisive factors that helped defeat Germany in World War II. Eight out of 10 German soldiers killed during World War II died fighting the Russians. That is, Russia eliminated more than 6 million German soldiers. Now chew on this: between 1939 and 1941, the German blitzkrieg – or lightning war – defeated Poland, Denmark, Norway, Belgium, Netherlands, Luxembourg, France and the 380,000 soldiers of the British Expeditionary Force stationed in France. Hitler then unleashed the same blitzkrieg against Russia. On June 22, 1941 more than 200 Axis divisions, comprising two million men plunged into a front 3200 km broad. Yet by winter of that year the Red Army was lashing furious counterattacks that would make the besiegers the besieged. Russia won the most mechanised war in history because it was able to out-produce Germany in a war of economic attrition. 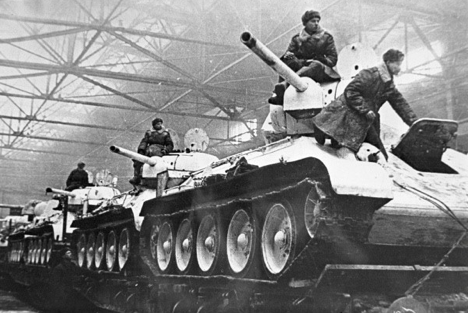 Russian production outweighed that of Germany in virtually every war item – tanks, self-propelled guns, field guns, machine guns, mortars, combat aircraft, rifles, carbines. Only in shipbuilding did Soviet industry fail to compete. Vecamer writes Russia was the single most important factor in the defeat of Germany. “Germany essentially lost the Second World War on the Eastern Front” and the key to that loss can be directly attributed to the fact that Russia was able to supply its army with the needed materials while the German economic system could not. Russia had built up a much more effective and reliable economic infrastructure since the 1920’s when compared to the German economy. Vecamer explains it was more optimally geared for mass production of simple, yet reliable (military) goods and products. Throughout World War II, Russian military forces never really suffered from serious supply problems. Russian production centres continued to pour out what was needed on the front lines. But the Germans often suffered from supply shortages. The Warwick volume says the Russian economy "produced weapons on a larger scale than Germany" and more of Russian war production came earlier in the war. This was despite the fact that Germans had a head start in the arms race. While Hitler has started secretly rearming his forces from 1933 onwards, the Russian entered the race only in 1937. The Russians also made a “top to bottom” review of their military supply system to seek the most efficient solutions. Western armies of the World War II era were still modeled on the old Napoleonic way of thinking – provide each combat division with ample service and supply capabilities so they can draw upon rear area stocks as needed. The Russians reversed that order – army depots and army transportation units would (more efficiently) deliver supplies to the troops; more combat troops could then be placed at the front lines. Of note is that the Russian military transportation system was far more mechanised than the German one. The German military transportation system still relied on horses in May of 1945. The May 1945 issue of the American magazine Army Talks explains how the Russians developed a supply and logistics system that was geared for winning wars. “The Russian ability to supply their armies is partly due to the hard work of scientists,” it says. “Some food was supplied from the Arctic Circle, because Russian scientists developed seeds which could grow that far north. New methods of hardening metals were discovered when the Germans took over the raw materials used in older processes. “One of the most important "supplies' in time of war and one where Russian scientists have made an outstanding contribution is in the field of medicine. US Surgeon General Parran said, ‘among the recent contributions of Russian medicine can be mentioned pioneer work on transfusion of blood and blood banks; transplantation of cornea, nerves, and other tissues. Russian medicine has also had large experience in extensive public health projects; in the prevention and eradication of malaria, typhus, tularemia and venereal diseases." Over 20 million people in Russia were evacuated eastward as the tide of German invasion swept forward. Says Army Talks: “What the people could not take with them, they destroyed. It was not easy, but homes as well as barns and unmovable equipment went up in flames. Orchards were chopped down. Livestock was killed or driven on ahead. “The mighty Dnieper Dam, symbolising industrial progress, was blown up to prevent the Germans from using the electricity which it produced. Hitler found the rich Soviet bread-basket empty and the earth scorched. “German efforts to convert mines, oil wells or factories to their needs were discouraging. The population which remained not only would not cooperate but they sabotaged the Germans in every way possible – workers by days were guerrilla fighters by night. “Practically no machinery had been left for Hitler to convert to his needs. The big factories of the Kharkov, Moscow, Leningrad and Rostov areas were moved eastward out of danger. V.N. Obraztsov, Director General of Traffic, said, "We had to cope with the biggest population movement in history — of evacuees and whole industries to beyond the Volga, to the Urals, to Central Asia and of troops with their vast equipment to the front." All this was happening in the backdrop of German territorial expansion, which added the industrial assets of much of continental Europe to its kitty. The occupation of industrialised Europe proved to be a major gain – a sort of invasion jackpot – for Germany and outweighed the costs of aggression. At the same time, German occupation significantly impacted Russian production capacities. The comparative power of the enemy. Malanin has ranked economic and technological factors right at the top. Clearly, the Russian political and military leadership knew what they had to do to ensure victory.